Blog: Couldn’t we just build lots of gas-fired power stations? We know that 20% of 2010's generation capacity has already closed and a further 35% will close by 2030, meaning that a big investment in energy infrastructure is needed – at least £100bn by 2020. New nuclear power stations are a big part of this investment, and will provide reliable baseload power to underpin intermittent renewables generation as the UK decarbonises its power sector. But some people have been asking why we can’t just build lots more gas-fired power stations to provide this baseload, rather than relying on new nuclear plants. There are good cost, environmental and security of supply reasons why we need nuclear as well as gas in the future energy mix. Gas isn’t necessarily cheaper than new nuclear power – it could be less expensive, but it could well be more expensive in the long run, and will certainly cost the planet more. Recently, some commentators have asserted that gas will be much cheaper than nuclear. Figures have been quoted that gas-fired power stations cost £0.5m/MW to build, whilst nuclear could be as much as £6.9m/MW. But these figures don’t tell the real story, as they just cover construction, not running costs. Running costs, including fuel used, are much higher for gas than for nuclear. A true measure of the cost of electricity generation takes account of total costs. Taking into account all costs, including fuel and carbon taxes, the average lifetime cost of a new gas-fired power plant opening in 2024 is slightly higher than that of Hinkley Point C, based on DECC’s central assumptions for gas and carbon costs, at an estimated £94/MWh. That means gas isn’t necessarily a cheaper option for consumers. And gas prices are also notoriously unstable. Back in summer 2008, gas was double today’s price – and it is quite possible that prices will rise again, especially if there are supply restrictions, as we saw in 2008 when Russia cut supply to the Ukraine. So relying just on gas for our baseload electricity generation would be a huge risk. We need to invest for the long term. 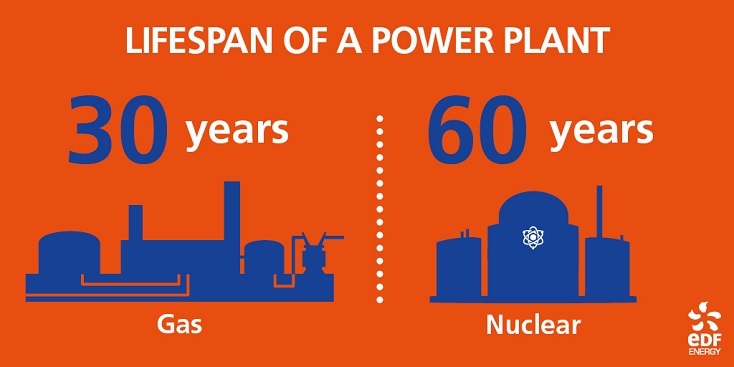 The lifespan of an average gas plant is around half that of Hinkley Point C, so if we just chose gas we’d face the same dilemmas in 30 years as we do today. By making the right decisions now, we can keep the lights on with low carbon electricity for generations to come. As well as providing 7% of the country’s electricity, powering 5 million homes, EDF Energy’s Hinkley Point C is part of the UK’s fight against climate change. The UK has got legally binding commitments to reduce emissions 80% by 2050 vs. 1990 levels, so as much as possible of our new electricity generation capacity needs to be low carbon – like nuclear power. Gas, however, isn’t low carbon – it’s a fossil fuel. Gas-fired generation is a much lower carbon option than coal-fired generation, emitting about half the amount of carbon dioxide, but is still much worse than nuclear. Just using gas to generate as much electricity as Hinkley Point C would increase carbon dioxide emissions by around 9 million tonnes per year. The UK’s own gas supplies from places like the North Sea are fast running out. This means in the future we will have to spend billions of pounds importing gas from abroad, even if UK fracking moves ahead quickly. 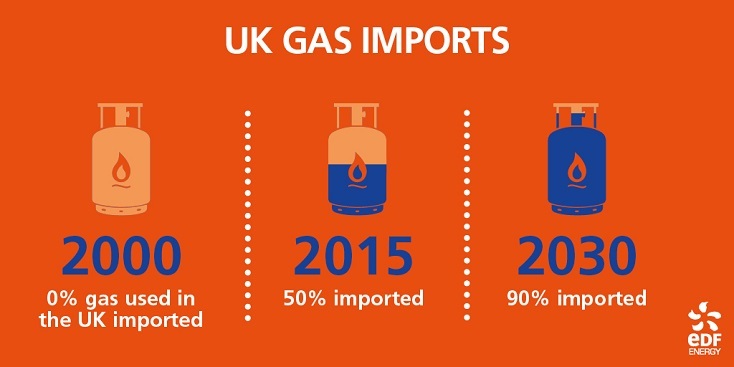 Back in 2000, we didn’t import any gas at all, but today half of our supplies come from outside of the UK. By 2030, up to 90% of our gas is likely to be imported. An over-reliance on gas powered electricity generation would mean relying even more on imports, putting us at the mercy of unpredictable international politics and financial markets. Gas still has an important role to play – indeed EDF Energy is investing in modern CCGT gas power plants. Even when all the planned new nuclear power plants are generating electricity, gas-fired plants will still be needed to ensure sufficient supply, particularly during times of peak demand. But, just as we shouldn’t over-rely on nuclear, we also shouldn’t just rely on gas.A future energy mix with significant new nuclear power, alongside gas and renewables, will help us to deliver a secure low carbon energy system at an affordable price.